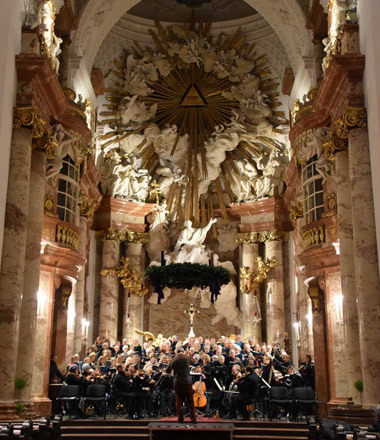 Sing Mozart Requiem at midnight - in Vienna. Every two years since 2012, Runbysingers has offered UK singers the opportunity to take part in a very special late night anniversary tribute to Mozart. 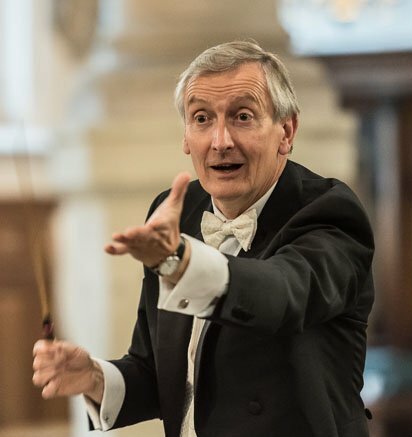 In 2019 we will return to Vienna's Baroque Karlskirche (St Charles Church) to join Jeremy Jackman, a full Baroque Orchestra and a quartet of professional soloists to perform this well loved work. The concert will take place just before midnight on 4 December and will conclude at the hour of Mozart's death at 1.00 am on 5 December. Please note, this is not a Bring & Sing event - places are strictly limited and the event is always over-subscribed. The 2018 event was featured in the Daily Telegraph. You can read the full article online here. 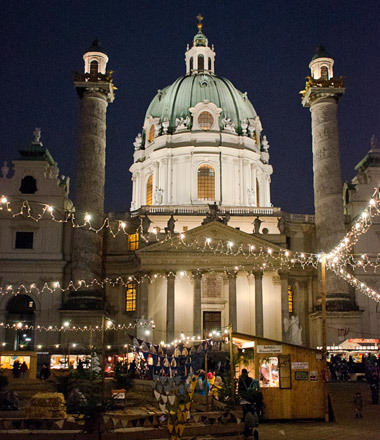 Vienna, for many people the music capital of Europe, is a magical destination during Advent with Christmas markets in full flow and visiting choirs performing in the Town Hall. Vienna is always elegant, sophisticated and cultured - but December sees it at its very best.There will be ample time to explore the Christmas markets, buy some hand-made decorations, or sample some hot punch and grilled sausages. You will also want to experience the traditional Coffee Houses, visit the Spanish Riding School and the Imperial Palace, explore Vienna's excellent art museums - maybe even take in a concert. Please consider adding on a day to your visit if you possibly can. The course will begin with a welcome drink in the Konzerthaus Hotel at 7.00 pm on Monday evening. Rehearsals will begin at 9.30 am on the Tuesday morning. This course is for experienced choral singers of all ages; it is not suitable for beginners or people who are not singing on a regular basis. Participants must be familiar with the work and have sung it recently - ideally within the last two years. You must agree to prepare your part properly before you come. There will be a pre-event rehearsal in London on Sunday 17 November directed by Jeremy which singers will be strongly encouraged to attend. If it has been a while since you sang the Requiem, you might want to consider buying one of the excellent ChoraLine rehearsal tapes/CDs available online. These are available for individual parts. We shall be singing from the Barenreiter edition of the work edited by Sussmayr and singers will need to bring their own copies of the score. You need the Vocal Score (BA4538) - which is pale blue - not the dark blue Organ score. We will stand for the duration of the concert so, if this is likely to be difficult for you, please contact us to discuss before booking. The costs of staging a concert in such a prestigious venue will be substantial so, to make it more affordable for our singers, we are working with a local concert agency to help us promote the event and sell tickets. Accommodation is expensive in Vienna and there is a balance to be struck between location and cost. For this event we have therefore chosen two hotels – a very comfortable four star hotel within walking distance of the Karlskirche – and a three star Mercure somewhat further out. There is a very good public transport service in Vienna including an underground train service, trams and buses. The four-star Hotel am Konzerthaus – popular with visiting orchestras - is ideally situated within easy walking distance of shops, museums and the Opera House. The staff speak excellent English, there is a large bar and restaurant, and a handy taxi rank outside the hotel. The price we have negotiated makes this a very good value hotel by Austrian standards but it will still be an expensive option for some singers. However, in previous years, most people have favoured the four-star option for it's superb location. The 3 star Mercure Westbahnhof is up to the usual Accor standard with clean rooms, good breakfasts and good transport links. It is quite a bit further out than the Konzerthaus but is likely to be a popular budget option. Single occupancy supplements apply to both hotels so, as always, we encourage people to arrange a room share wherever possible. This bit is up to you and is not included in the price. Runbys are mostly experienced independent travellers so choose your own carrier, flights and route - and do think about staying an extra day just for sightseeing -we will be happy to arrange this with the hotel for you. Most people fly directly to Vienna but there are also budget flights to Bratislava which is little more than an hour from Vienna by train. The cost of the holiday including the concert, three nights B&B at the Konzerthaus and a three-course evening meal will be £895 per person sharing. (Single room supplement £45 per night) The Mercure option will be £745 per person sharing (Single room supplement £35 per night) Non-singing partners are welcome - subject to availability - and pay a reduced fee of £695 and £545 respectively. This includes full participation in all group activities and a reserved VIP ticket for the concert. We will require a £150.00 deposit per person and the balance will be invoiced no later than 5 October 2019.